Figuring out what you actually want is one of the toughest jobs that life will ever task you with. It’s the same with recording music and finding your sound. You probably wrote your songs with a certain melody and maybe a certain instrumentation in mind. At least that’s how it works for me. I write a poem, and instantaneously have a melody that is associated with it. Thus, the two essential parts of a song are born: rhythm and rhyme. But unless you are a seasoned musician you probably don’t have much else – a lyric sheet and a handful of chords. If you are Bob Dylan, you can stop the thought process at this point, because quite likely you have already created a masterpiece. However, if you are a mere apprentice of the songwriter craft (like I am), you may have to invest a bit more time to make your song a wholesome experience. There are basically two major ways in which you can tackle the instrumentation of your songs: 1) external feedback and 2) experimentation. I suggest you employ both approaches. Should you already have determined the identity of your producer, you can embrace method 2, and let your producer tell you what he imagines when he hears your music. Any producer who is serious about his craft will tell you his opinion anyway, thus making it difficult to avoid. In general, your recording technician and producer are more experienced than you are. They have done this for years, if not decades; they probably know your style of music better than you do, and they can envision the impact that the implementation of certain instrument tracks would have on your songs. They should gracefully guide you through the process of instrumentation, and have a pretty good idea of which instruments will elevate the quality of your composition, and which won’t. Example: when I started putting together a list of instrument wishes for my debut album, I thought of a violin part for almost every song; I just love that instrument. However, my producer successfully argued against that notion. Not only would all songs sound similar, due to their similar instrumentation, it would also require a much bigger string section for many of the songs. Several of my compositions lend themselves to the cello or bass, but if you hear more than one of these classical string instruments in a song, you usually expect to find the others as well. When you hear a solemn love song with an accompaniment of cello and violin, you will likely expect to also hear viola and upright bass, because our ears are used to that sound cloud. However, you probably can’t afford a full string quartet for every song, and you may not appreciate the classical concerto impression that you receive from it. Listen to your producer; he/she usually has a good ear for these things. Regardless of whether or not your producer arranges instrumentation for you, you should always have your own vision of album sound. Maybe you will be “wrong” with much of the instrumentation that you envision, but a falsified opinion is better than none. Having no opinion degrades you to a mere spectator on your own record, which alienates you from your own songs. It also is good training for your ears and imagination (which I hear are staples of a good musician). The easiest way for me to become opinionated about my songs is experimentation, which is relatively easily done using demo recordings. Your producer most likely will ask you for demos anyway, so there is no point in dragging that task around. Get a microphone, and go for it! Here is what I use: a Rode microphone (NT1-A), a mixing board (because that mic requires phantom power, and because sometimes it is easier to record guitar and vocals simultaneously), my laptop (line-in), Kristal (a good recording software that is free as long as you don’t use it commercially), and a random set of furniture (to create or eliminate acoustic effects). This is already quite sophisticated, and you can use less, if you like. One year ago I started recording acoustic music live in the kitchen, using only a digital camera (Nikon Coolpix). I upload those videos to YouTube, and people genuinely enjoy the quality that this simple $300 camera provides. 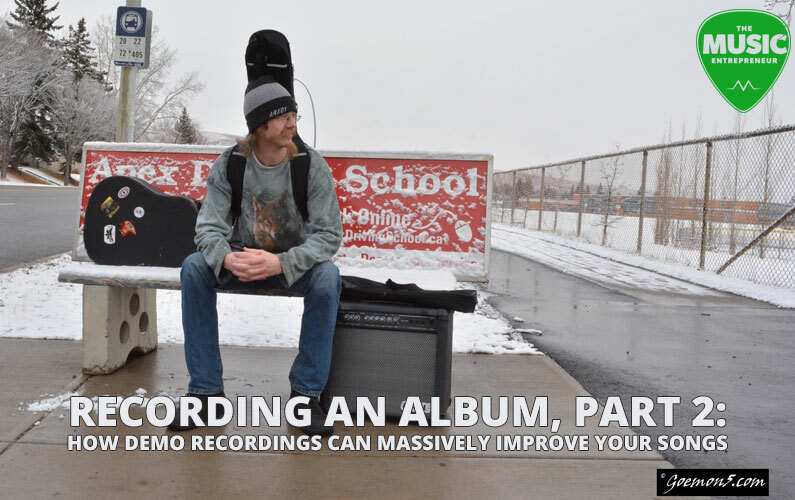 Thus, if you only want to demo your songs in their raw form, a careful recording on your phone may suffice. My favorite demo is an A cappella song that my friend Joanna and I sang into that pocket camera, in the hallway behind a café. However, my up-scaled recording setup provides me with additional opportunities. I can immediately listen back to my song. When I have played a song less than fifty times, I usually spice it with little musical errors, such as mumbles, bad pitches, breaks, speed-ups, or other mistakes that sound okay when you do them live, but are very annoying when you hear them repeatedly on a record. When you listen to your own demo, you are likely to spot those little issues, and eliminate them before you hit the studio. Remember: studio time is more expensive than hanging out at home. Once I have my song recorded and am happy with my performance of it, I can add more tracks to the mix. 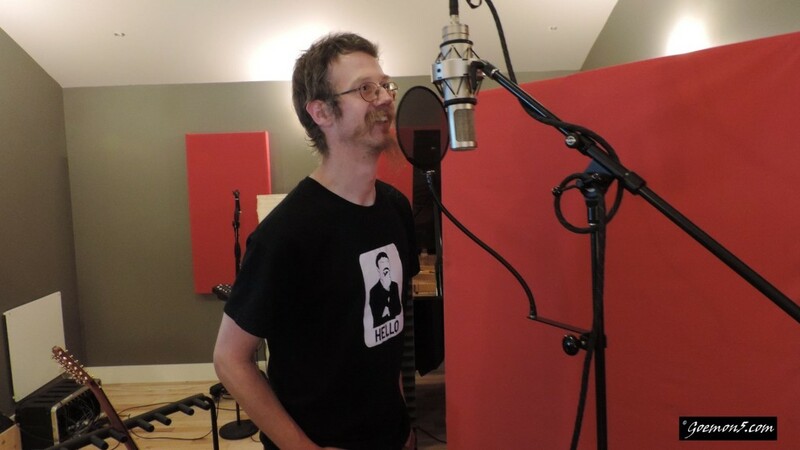 I love vocal harmonies, and I recorded various demo songs with three-part-harmonies on the chorus. You can also add a simple line of guitar notes that are set one octave above or below the original guitar chords. You probably also have a tin and some rice at home, so you can improvise your own repertoire of shakers (those are also fun when friends come around to jam!). Should you play more than one instrument, this is a great time to improve your musicianship. My living room currently harbors guitars, ukuleles, banjos, djembes, and a beautiful vintage mandolin. Some of these I can actually play, with others I stick to simple chords or beats. It doesn’t matter; the point of this exercise is to pick up an instrument that you find suitable, and play along to your demo songs. It won’t take you long to decide whether or not the sound of a particular instrument fits the mood and tempo of a particular song. And you don’t need to be particularly good to hear that. Even if you borrow an instrument from a friend or buy a very used one, you are still better off than never having touched it. My first ukulele, for example, I bought used for $30 from a lady off Kijiji. Its sound is nowhere near recording quality, but just for the intention of plucking around and discovering melodies it has served me well. And really, a ukulele is just a guitar with two strings missing, and the capo on the 5th fret. So, if you play one of these two instruments, you can fake your way around the other. Another advantage of experimentation is the discovery of new sound. A year ago I decided to move my ukulele play to the next level, and purchased a really nice handmade Hawaiian instrument. I gave my old uke to my friend Joanna. Joanna Drummond is a fabulous songwriter with two great albums in her purse, but despite her extensive piano background she writes almost exclusively on guitar. A month after I gave her my old instrument she looked up some ukulele chords, and spontaneously wrote two songs with it. I know, we’ve ran a long way from the demo idea, so I’ll finish this thought quickly: new instruments not only help you develop your own sound, they often also provide fresh inspiration for new styles and songs. Go and buy one, borrow one, build one. Anything but ordinary! Making my own demos has provided me with a much better idea of the tools and practices available to recording technicians and sound engineers. Hitting the space bar to start the recording process is simple enough, but the arrangement of microphone and environment massively changes the sound dynamics. There are many lessons to be learned from the demo process, beyond the ability to converse with your producer about his craft. Recording myself, and experimenting with different spatial arrangements and volume levels of my instruments and microphone has markedly improved my stage performance, simply by raising my awareness of the resonating environment. Experimenting with instrumentation and vocal tracks will gradually teach you what kind of instrumentation works for what kind of song, and which arrangements are worth rethinking. Even if you don’t consider yourself a musician, you should still have a general idea of the instrument families that are frequently played in your genre. It provides perspective and fills your brain with material that is worth discussing, be it with your musical friends or your producer. Musicians (and I count the common songwriter into this group) are creators. And nothing quite pushes your creativity like the experimentation with sound. Thank you for reading this excruciating endeavor into demo recordings and instrumentation. Next week (so you are still with me) I will talk about my producer (without ranting! ), and my selection criteria for songs.